There has been some discussion on the NGRM forum recently about controllers people use. Since I don't have a lot of time for modelling at the moment, I thought it would make an interesting post to describe the powerpack and controllers I use. 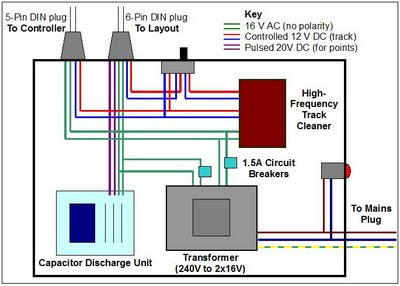 Anyway the basic principle is to provide the layout with all the power sources it needs, in this case a controlled 12V DC for the track, a pulsed 20V DC for points (i.e. a CDU), and a 16V AC supply for anything else - though so far I haven't found anything that needs it! My powerpack contains a transformer with 2 x 16 V AC outputs, both protected with thermal circuit breakers (this is very neccessary to avoid blowing the transformer in the event of a short-circuit), a Capacitor Discharge Unit for points (can't recall the make), and a high-frequency track cleaner (Gaugemaster). The latter can be switched out, in case of delicate motors! The schematic below should make all this clear. All this is contained in a sturdy wooden box, the mains cable is clamped, fused at plug, with a neon to show the power is on, and of course the transformer is earthed. Some vent holes, a handle, and a couple of hooks to provide somewhere to wind up the cable complete it. There are two DIN sockets, a 5-way is the standard for hand-held controllers (16 V AC in, controlled 12 V DC out), and a 6-way for the lead to the layout. Each layout then just needs a socket for power in. See photo below. In fact I have a second powerpack, an ultra-small one for very small layouts (one of my layouts is not much bigger than this powerpack!) containing just a transformer and track-cleaner. Points need to be manual, or as on Southon Yard, I built a simple CDU into the control panel for the single point with a rectifier and capacitor! If you wanted to avoid doing mains wiring, you could mount a cased transformer onto a board or in a box containing the low-voltage wiring. The photo also shows the hand-held controller, in this case an AMR. They are long since out of business I believe, but I picked up a second one second-hand recently. I also have a Gaugemaster "HH" which is very similar, but I prefer the toggle direction switch of the AMR to the slide switch of the HH - it is kinder to the thumb! I also think the AMR gives better control, but I have no way of measuring it! Both are of the "feedback" type which I find gives good low-speed control. I don't run loco's far or for long on my layouts, so I have never seen any overheating issues that some find with feedback controllers and HF track cleaners. I managed to get out to another show this weekend, at Sompting Village Hall. This is a small show, but the small hall was well stocked with layouts. Some were a bit busy for me, of the rather over-stocked N-gauge type, but they do entertain the public and my 2-year-old! I don't remember the names of the layouts and no show-guide, but some pictures of those that caught my eye are below, and included a superb 7mm scale tram (I've seen this layout before but the detail is fascinating), a 7mm scale NG industrial (compact and nicely done), and a Swiss HOm and HO layout (a bit too much Bemo but superb scenery). As a bonus, I happened to notice some microtrains couplers on a trade stall, they must be second-hand or old stock judging by the packaging, but I needed some and they were cheap as well as saving postage! As you may have guessed, I haven't managed much modelling recently and probably won't for a good few weeks (see post of the 19th April if you haven't), but there are some small jobs I can do here and there. Also I have some other thoughts for blog entries to fill in some of the gaps!